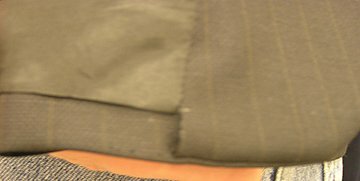 Right off the bat, I should mention that I really wanted to call this post “Just how many ways can you do this wrong?” To refresh your memory, this post is regarding how to do that lower inside front portion of a tailored suit or sportcoat -where the facing, hem and lining all come together. The past posts of the nameless tutorial that pertain to this particular entry are #1, #2 and #3. To get you up to speed, below is a photo of the sample -now pressed- that I sewed before (from #2). I think we all agree that the photo above illustrates how these seams should be sewn. However, how can we know this is really true if none of us have actually seen this in actual practice? If you go through your wardrobe or that of a male member of your household, you’ll find a myriad of work-arounds that were done unlike the sample above. How is it that in spite of having evidence at hand, we can know that the above method is correct, rather than the way we’ve all been used to seeing it done? These are not rhetorical questions. After you examine the evidence I’ve provided, I’d like to hear your ideas on the topic. To collect this “evidence”, I went scouting/shopping with my significant other. We shopped at two very well respected retailers -who will remain nameless- but I believe these workarounds are to be found in every retail establishment of men’s tailored clothing. The labels we selected shall also remain unidentified but I’ll summarize them as Italian, French and US made. Two lines were house lines. The other lines were from well known and highly regarded menswear designers. Regarding price points, the least expensive product was $250 (clearance) and the most expensive was $650. Anyway, here are a series of photos we took whilst in the fitting room. 1. Now, the sample above looks similar to mine but if you notice, the facing has not been completely stitched to the hem that it faces. Naughty Designer! No more silk swatches for you! 2. In the photo above, you can see the same old trick. I have one thing to say for this label tho and that is at least all of his workarounds were uniform. Surprisingly, one label (designed by a French designer but constructed in Italy) had ten different workarounds, depending on the style! Incredible! If you have to use a workaround, be consistent. 3. I found the sample above to be problematic on several levels. First of all, the hand stitching of the lining to the facing is just a bogus waste of time. It’s not adding any value to the customer. Second, you can see that the troublesome part was hand stitched separately from the lining/facing hand sewing which means that little trick took two different passes with hand stitchers. Third, the last tad of the vertical facing seam -where the facing joins the hem- should be aligned perfectly vertical with the lining-facing seam but it’s not. Several of the samples looked like this one. 4. Above, you’ll see another variation of #3 but in another color way. 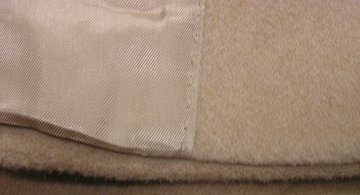 You can see two different passes at hand stitching and the vertical facing-hem seam is not aligned with the facing-lining seam. These should match up perfectly. Also, in this photo you may be able to see that the last portion of that facing seam that’s joined to the hem is also tacked by hand, making for hand sewn seam #3. By the way, I have nothing against hand sewing. In fact, I like it. However, hand sewing should be reserved for those effects that create value. You should not elevate a workaround into a purportedly “couture” technique by using hand stitching. It’s not honest and has no integrity. Really. 5. 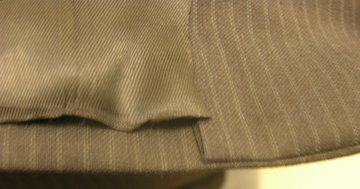 The photo above isn’t well focused but you should be able to see the hand stitching on both the inside juncture of lining to facing and facing to hem. Also note that the entire facing seam is not vertically aligned. These seemed to be a common theme. 6. 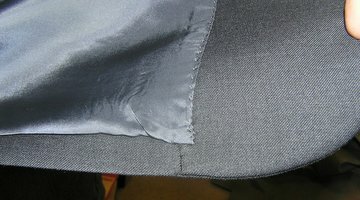 The photo above shows the lining flush with the hem. Further along the hem edge, the lining has been pressed upward. This coat was 100% cashmere so it wasn’t cheap. 7.The photo above illustrates a herringbone that was made in a similar fashion to the photo preceding this one. Of all the jackets with the workarounds, this house label was the best value. I mean, if you’re gonna pay for a workaround, you should pay the lowest possible price, no? 8. I describe the sample above as a slick attempt to get your iron to do your work for you. Again, the lining edge is flush with the hem and the lining has been pressed up and out of the way of the hem once it departs from the facing juncture. Now, to refresh your memory, below is a photo sampling what this joining juncture should look like. It’s clean, all seams are even and match. All seams were sewn in one pass. There is no hand stitching required. It looks cleaner and more professional than the above samples. Again I ask you, how do we intuitively know that the above sample is the correct way to do it when few of us have actually seen this treatment in actual products? If you have any ideas or comments, please leave them so we can sort this thing out. How to determine what is the “correct” way to put things together–I personally don’t think this is a patternmaker or sewists’ job exactly. It’s up to the designer to determine what properties their customer wants, and communicate that effectively to their industry partners. For example, if a customer wants their expensive jacket to look like it was hand-made, then putting random & unnecessary hand stitching in there is giving that customer the satisfaction of being able to see hand stitches. Now, if a customer wants their jacket to look neat, clean & unfussy–and don’t want to pay for unnecessary handstitching, then your way is the best. I also don’t have any problem with #6-8. Are they functionally inferior? More expensive to produce? These are questions, not guesses. particularly the last sentence (I really need to do a review of the book _the innovator’s dilemna_). For example, if a customer wants their expensive jacket to look like it was hand-made, then putting random & unnecessary hand stitching in there is giving that customer the satisfaction of being able to see hand stitches. It is totally possible to do handstitching but I’d argue it should be done more effectively. What your comment made me realize is that I failed to explain -that even without hand stitching- all of the workarounds are much more costly. Why not do it the pretty way (clean) but have hand stitching on the lining side? That would be effective and convey a hand made feel for the piece. I also don’t have any problem with #6-8. Are they functionally inferior? More expensive to produce? Gosh, how to explain this…yes they’re more expensive but it’s more than that. How do you describe that feeling of hesitation that you get every time you’re getting to that ‘difficult’ part of a project -it’s a move that you dread. Well, doing it that way is like that. It’s definitely more problematic to sew. You have to line things up just right and the pattern has been rigged to do it but it just doesn’t feel right. You’ve given me an idea. I could make the patterns that these workarounds need to be executed. People could download and try them out themselves. Then, they’ll see which are the easiest and least problematic to sew. What do you think? An obvious place to put hand work, if you feel you must have it to demonstrate quality, would be worked x’s to hold the CB lining pleat at the inside top of the jacket, and again at the waist. These are usually done with matching silk buttonhole twist, and run for 1 1/2 – 2″ in each section. Quality menswear jackets do not usually have a back facing (comments? ), just the pleat pressed in, so this would be more visible and more functional. I’m not sure I can answer your question, “. . . how do we intuitively know that the above sample is the correct way to do it when few of us have actually seen this treatment in actual products?” I consulted lots of sewing books to help me respond. 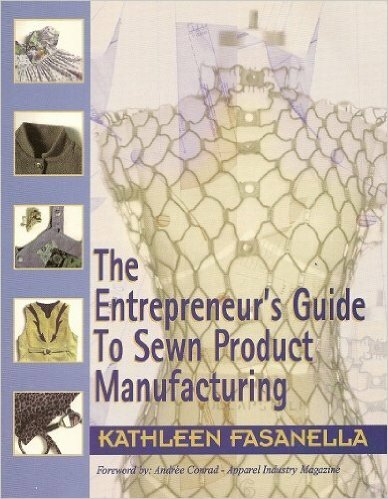 Actually, I have looked up the jacket and facing hem instructions in 11 sewing books that I have (I like books). None of them show this jacket hem and facing intersection as you have shown in the first photo. All of them instruct the reader to slipstitch the lowest edge of the facing to jacket hem, and then insert the lining by hand or use the bagging method. 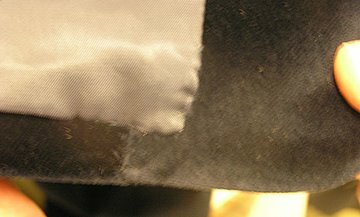 But, neither of the techniques results in the clean look of your initial photo with the vertical seam of the lining to the facing match the seam of the facing to the jacket hem. Yours is very neat and professional looking. Some of the books I consulted claim to share “industry secrets”, but I guess they held back on a few. 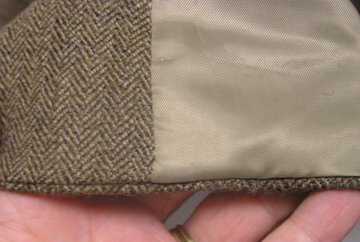 One other way your method differs from the ones in my books is that the books recommend having a pleat or fold of excess lining hanging down about a Â½ inch or more over the upper part of the jacket hem. The purpose of this excess fabric is to “provide ease in donning and removing the jacket”. According to the Vogue Sewing, “This fold allows for body movement and stretching during wearing without putting strain on the garment hem”. But Iâ€˜m sure that this fold is really necessary. But I found this fold on all of the suit and jackets in my closet. Even on the jacket and suit I had custom made for me when I was in Hong Kong. It may be an old tailor tradition â€“ perhaps you may know why. But, thanks for reviewing this technique, which I like a lot. No matter whether it’s the accepted “correct” way or not, I prefer the look of your method. It’s neat and clean. That last bit of handsewing at the bottom of the facing is about as appealing to me as hand sewing a facing to a zipper. I don’t dislike hand sewing per se, but I feel it often adds a Loving Hands at Home look rather than the couture look that may have been intended. In my opinion, there are much better ways to use hand stitching to add perceived value (and perception of quality) to a garment. From now on, I won’t be doing it any other way. Thanks Kathleen! I looked at my thrift store jackets (men’s) sporting the union label along with some Italian names and the process they used was either #6 or #7 in your examples. 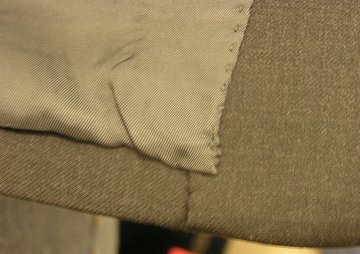 However, a famous American female designer used your technique in her jacket except that she included the typical ease fold in the lining at the hem. Maybe the guys are old school. They’ve been sewing them like that for years and keep handing down the same tailoring and processes. That’s the technique I learned, exactly the same steps as Kathleen’s method but with a “jump pleat”, an extra bit of length in the lining that I was taught to do to prevent the lining tugging and distorting the jacket. Kathleen, do you put length in the lining somewhere else? Or is this another fashion school bugaboo? I agree with Danielle that there needs to be length in the lining to keep the tail from riding up. Is it there and I just can’t see it in the photo? Oh my god do I ever know that feeling. I experience it daily. Is this really a right/wrong thing, or is it possibly proof that sewing really IS about “whatever is most comfortable for you”? Like, what if the step YOU dread is cheesecake for another sewer, but he/she hates the stop-at-the-dot step you mentioned as the one downside of your method? Okay, this is a slightly OT question, but: what do you do about the wigan? is there no wigan in that corner because there’s no lining/hem seam to attach it to, or do you do you extend the wigan to the edge and make it stay in place through some other wizardry? In fact, a whole post on the correct usage of wigan would be SO AWESOME. While Kathleen’s way looks neater–most woven fabric jackets/coats need the extra pleat of fabric for body movement–and for that matter because the outer fabric is less stable than the lining. I do agree that the lining does not need to be hand sewn to the front facing. Especially with a such a visible pick stitch–but what the pick stitch does is keep the lining from rolling out to the front of the jacket/coat–so it’s not just hand sewing for brag purposes. A machine stitch won’t work the same way–not unless you top stitch. I think this is neat that Kathleen bring this up–in one of the costumes shops i worked in we often did tailored jackets/coats for shows. The owner found a nice way to finish the edge without a lot of hand stitching or bulk. What i do remember of the method is that the lining along the facing and the facing edge would not be flush–partly because you don’t want to turn back the facing fabric at the bottom–too much bulk and then it’s going a different direction than the rest of the facing seam. That raw edge gets cross stitched down at the end, unless the fabric is thin the it would be turn back flush. I think our method looked most like none of the above. I will see if i can find more info. But you gotta have that hortizontal pleat. On a nomaclature note: i make a plea for using “stitcher”–in costume shop parlance for someone whose main job is to stitch–either by hand or machine. Operator is also acceptable–short for machine operator. I think much more accurate than sewer (to easy to confuse with where waste goes) or sewist–doesn’t seem quite right to me. I agree with Jinjer the extra pleat of fabric is needed for body movement and because the outer fabric is less stable than the lining… Especially after wearing the gmt for a while I should guess that the shell has more “life” than the lining (can I say it like that in english??) Or maybe I wear my gmts to carelessly, haha.. Anyway, I think #6 looks quite nice, but it would be super to see the jackets live and maybe cut a bit in them as well before really saying anything! Emma, many didn’t understand why the pleat doesn’t function as they suppose it to, until they saw the step by explanation. Even Jinjer agreed this is the better solution. The ease is there, it’s just placed where it’s needed rather than at the hem of the garment. Be sure to read the comments under that entry for why we intuit this method is correct. Your technique is clean and elegant and very appropriate for engineered garments whose lining has been bagged. HOWEVER, the examples 1-5 show garments whose lining has not been bagged as they were produced using more traditional tailoring techniques. 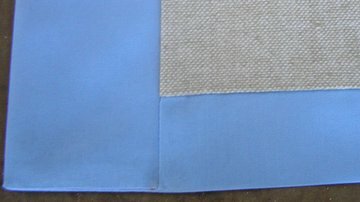 When the front is basted onto the canvas there is a certain amount of distortion in the cloth (this is required for the correct fit); as the lapel is padstitched there is more distortion (actually I should say shifting) as the canvas is rolled; the bridle is applied, drawing anywhere from 1/4″ to 1/2″ depending on the length of the breakline; when the facing is attached to the front, fullness is required around the notch, over the breakpoint and just below the breakpoint- certain fabrics allow more fullness and certain drier fabrics allow less fullness and the amount used is determined by the person basting the facing in preparation for the front seam. Furthermore, the shrinkage of the fabric is never completely consistent and the length grade amount from size to size is only 1/8″ so there is little or no tolerance. To adequately deal with all these distortions, shrinking, easing, etc. the front of the jacket is deliberately cut larger than required- after the canvas has been padstitched and the bridle applied, the back is measured to determine the exact length and the hem is marked. Then the front is “shaped”- it is cut down to the actual shape along the front edge and the lower curve; this is usually done using die cutters for maximum precision. Then the facing is basted to the front, easing at the notch and around the breakpoint, at the operator’s discretion. 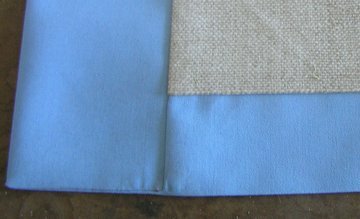 After turning the fronts, the facing is again basted in several operations, then the seam allowance of the facing is tacked to the canvas- the seam allowances of the lining are often basted to the corresponding seam allowances at the back side seams. The lining is basted across and down the jacket and the excess is folded under at the bottom- a felling machine is used which fells the lining in place with a stitch which closely approximates a hand-felling stitch. After the sleeves have been set the lining is again tacked into the armhole- the seam allowances of the sleeve lining have ben sewn to the seam allowances of the sleeve fabric so the only way of closing the armhole is by hand- this also avoids going through the pad and canvas by machine which would compress the whole and create stiffness which the hand-felling avoids. Having lining seam allowances tacked to the shell allowances ensures that nothing shifts or pulls and will never sag below the hem- there are also many steps used to build the shape in the tailored garment and having everything held together permanently ensures a lasting fit and shape. These steps are very time-consuming and thus expensive and have been replaced with fusibles and by bagged linings in lower-end men’s garments (photos 6,7, and 8 show bagged linings). A pre-engineered finish is thus impossible in this type of garment, and the finishes in photos 1-5 are generally a sign of a very well made jacket- far from skipping steps or lazy design, they are indications that much greater care was taken in constructing those garments than the ones shown in photos 6-8.